The W5100 provides a network (IP) stack capable of both TCP and UDP. It supports up to four simultaneous socket connections. The shield contains a number of informational LEDs. 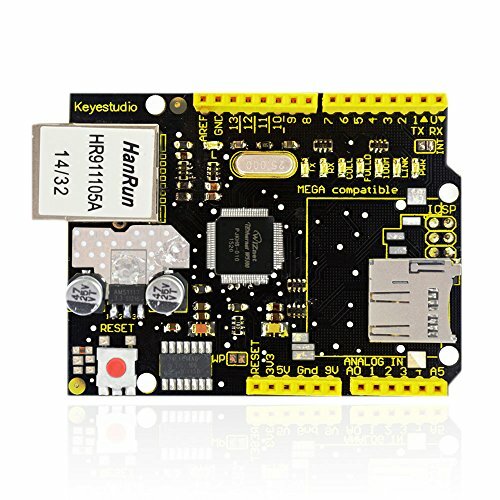 keyestudio W5100 Ethernet Shield gives you an easy way to get your Arduino Online. It can turn your Arduino into a simple web server or use the Internet to read /write its digital and analog outputs/inputs. It is directly supported by Arduino official Ethernet Library. It also supports the read &write of mini SD card (TF card). The shield adopts stackable design. You can directly plug it to Arduino board. It's also compatible with our other shields.